Make homemade soft pretzels—the recipe is easy. There’s no need to wait for a trip to the ball park: You can make these popular pretzels at home. While street pretzels use coarse or kosher salt, you can substitute poppy or sesame seeds, use seasoned salt, or make some of each. This recipe makes 24 (1.5 oz.) pretzels. Serve them with German-style mustard. Want a good beer with those pretzels? Check out our Beer Section. This recipe is courtesy of the Home Baking Association. Place warm water in large warm bowl (heat it in the microwave or with hot water). Sprinkle in yeast; stir until dissolved. Add milk, oil, sugar, salt and 1-1/2 cups flour; blend well. Mix in additional flour to make soft dough. Knead on a lightly-floured surface until smooth and elastic, about 5 minutes. Place in a greased bowl, turning to grease the top. Cover; let rise until doubled in size, about 30 minutes. Punch dough down; divide into 24 pieces. Roll each piece into a 16-inch rope. To make pretzels, curve the ends of each rope to make a circle; cross the ends at the top. Twist ends once and lay them down over the bottom of the circle. Place the pretzels on greased baking sheets. Cover and let rest in a warm, draft-free place for 5 to 10 minutes, until risen slightly. Preheat oven to 350°F. 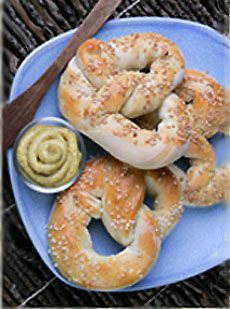 Brush the pretzels with the beaten egg mixture and sprinkle with the selected topping. Bake at 350°F for 35 minutes or until golden. Cool on a wire rack. Recipe © Home Baking Association. All other information Lifestyle Direct, Inc. All rights reserved. Images are the copyright of their respective owners.